Forty years ago, as a chemical engineering student, I learned the tedious craft of chemical plant design. It was a world of heat exchangers, distillation columns, reactors, tanks, pumps, valves, and dryers. I liked the classes, and would spend hours talking to my professors about the design of the factory. Getting good at factory design is a merit badge of sorts for the chemical engineer. When I moved into industry, and the real world, I managed engineering teams. In this position, we designed real-world plants. It was usually a team effort stretching over years. Each project would usually have a cool name, and management exposure. The placement of equipment and personnel was carefully crafted through revision after revision as the factories moved from design to operation. Designing a factory is serious work. It is now part of my DNA. Let me start with a true confession: I am a manufacturing gal. It is in my blood. I wore safety shoes and hard hats for over 15 years. There are still bunions on my feet from the steel plates rubbing on my toes. I relished the sound of a manufacturing line when I opened the door of the factory in the morning, and I liked managing inputs so that we could maximize outputs. I also liked seeing people grow and building teams in the process. Manufacturing is the foundation of my interest in supply chain management. In manufacturing, I became good at labor bargaining. I worked at union and non-union plants, and being a no-nonsense gal that loved to argue, I ended up negotiating third- and fourth-step grievances. So when the warehouse team threatened to unionize, I transferred into a distribution/warehouse environment. This was the beginning of my journey from manufacturing to understanding larger supply chain concepts. The year was 1985. It was a foreign world. I knew nothing about the world of logistics, inventory management, and order optimization. It was on-the-job learning, and I felt that I was drinking from a fire hose. Let me continue with my story. I ran distribution centers for the next 15 years. Much to my chagrin, when I entered into the world of supply chain, the processes of source, make, and deliver were usually not designed. Instead, they just happened. Over time, companies acquired assets. It was hard for me to rationalize the world of manufacturing that was deliberate and designed versus the emerging practices in supply chain. The conversations were vastly different from the world of manufacturing. How so? Let me explain. The focus in supply chain groups was not on how to design the operations so they were more effective; instead, it was about the use of best practices to maximize the value of what we had. It bothered me then, and still does today. I think that supply chain design is at the center of a great supply chain, and the best processes are deliberate and intentional. It should not be functional, with a narrow focus on a singular function like manufacturing or transportation. Instead, I think it needs to be holistic to balance the trade-offs of source, make, and deliver together. This is difficult for the average company since only one out of two supply chains have source, make, and deliver reporting through the same organization (reference Figure 1). I find it ironic. Companies talk about the need to be proactive, and agile. However, by and large, they are not. Why? I think that the gap starts with the lack of design. Most have inherited supply chains that they try to run efficiently with the lowest cost per case. Based on the corporate strategy, the most efficient supply chain—with the lowest cost per case—may not be most effective. In fact we find that it seldom is, as shown by the recent data from our surveys at Supply Chain Insights. As shown in Figure 2, one in two leaders today think that supply chain processes aren’t adequate. I think changing this picture requires intentional design. From the research, we know that when organizations have source, make, and deliver reporting to the same leader, supply chain performance improves (at the intersection of operating margin and inventory turns). In addition, we can see from the research that when companies focus on the design of supply chains, supply chain agility improves and there is better alignment in the organization between finance and operations. It is statistically significant. Supply chain design looks very different by company. There are different levels of maturity. Today, three out of four companies greater than $10 billion have a network design group that averages seven people. So, how do companies get good at supply chain design? Where are the supply chain architects of the future? This shift will not happen overnight. It is about changing traditional paradigms and building the processes to make design a priority. This is the goal of this blog. For clarity, let’s start with a definition. For the purpose of this article, I define the processes of network design as the use of analytic tools to model and optimize the supply chain. The work can use multiple technologies and combine cognitive learning, simulation, and optimization. I find that companies move through a five-stage maturity cycle. In short, I don’t think we spend enough time designing our supply chains, much less our value networks. Stage 1: What Are the Right Bricks and Mortar? The earliest form of network design is a focus on the bricks and mortar. The focus is where are the right locations for factories and distribution centers? The focus is on the physical flows of supply chain. This analysis is ad hoc and is usually stimulated by the launch of a new product or a shift in capacity. The design efforts are usually coordinated by a central group like a Center of Excellence. Stage 2: All about Transportation. In this phase of network design, the focus is functional. It is usually driven by the logistics and transportation functions. The focus is to rationalize the flows from the distribution center to the customer. The flows are typically linear and the analysis is on alternate modes and best shipping lanes. This work is typically periodic to accompany a freight bid or an end-to-end project. Stage 3: Building Effective B2B Networks. 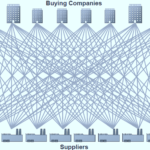 At this level of maturity, companies are looking at the complexities of supply networks—manufacturing outsourcing, supplier development, and the management of complex distribution, or demand networks—customer shipment alternatives, distributors, and trade-free zones. The focus is on the definition of business policy. It is often stimulated by failure. The projects explore the alternatives for risk management, tax efficiency, social responsibility, and the complexities of outsourcing. The growth of e-commerce puts pressure on networks for a quicker and more accurate response. Companies need multi-tier Available to Promise (ATP) and real-time inventory management. Network complexity grows quickly which rules out many of the available technologies. In this work, the use of linear optimization (which usually is about averages) is augmented with simulation to test network feasibility (the ability of the network design to manage demand and supply volatility). However, the work is still periodic. It is not an embedded systemic enterprise process. Stage 4: All About Flows. In the next phase and evolution of design maturity, companies realize that product flows are only a piece of the puzzle. There are more flows than materials to make products. In this evolution, cash, information, and inventory flows, grow in importance. At this stage, network design efforts become an enterprise-class process with a monthly analysis of the network. This is often coupled with Sales and Operations Planning (S&OP) processes. Terms like push/pull decoupling points, form and function of inventory, and buffer analysis become a part of the lexicon. (For more on this level of sophistication on inventory management check out our recent inventory management report.) Companies like Cisco Systems, Intel, Hewlett-Packard, and Seagate are at this level of sophistication. Figure 3 is a good overview of the current state of network design in the industry. Stage 5. What Should the Network Be? In the last and final stage of network design maturity, the focus is on a clean sheet of paper. The question is not to optimize what exists, but to develop a road map of what should exist. This work is useful to baseline the current state of the business and brainstorm higher levels of performance. In this analysis, the evaluation of partnerships and design partners is holistic, optimized from the customer’s customer to the supplier’s supplier. The focus is on value, and understanding supply chain potential. While this may seem academic, it is very useful for an executive team to see the difference between an “efficient network that operates at the lowest cost per case,” a “responsive network that can shift with the quickest cycle time to market demands,” and an “agile network that can deliver the same cost, quality and customer service levels given the levels of demand and supply volatility.” These are three different designs. While executive leadership teams will often use these terms interchangeably, seeing the impact on a geographical map for a global network stimulates a different level of dialogue. It is an awakening. Why? Executive teams are guilty of using these terms frequently without realizing the difference. Seeing the difference in a tangible network design stimulates a new discussion. These are my thoughts on a foggy Wednesday morning, holding a warm cup of coffee. I would love to hear yours! Want to connect? I would love to. This week, I will host our monthly webinar on S&OP: Why Is It So Hard? tomorrow at 11:00 a.m. EDT. I will be joined by Peter Murray, a board adviser of APICS. Peter will share his insights on our recent research; and together, we will ask the audience to rate the factors in an interactive session. We have over 100 people registered and we want to make it a dialogue. We hope to see you there! I then pack my bags and scoot out the door to sign books and discuss the research completed for the Supply Chain Metrics That Matter book at the ISM event on Thursday, May 14th in Atlanta. The book is selling well and will be translated into Mandarin for the Chinese audience for a release in August 2016. This will be followed by work with a high-tech client in San Francisco on the evolution of supply chain technologies, and then I’ll speak at a client session on Monday on the Supply Chains to Admire work in Phoenix, AZ. The next nine days will be spent on the road with clients. Life is also busy at Supply Chain Insights. Our newsletter, with three new reports, releases on May 21st, and we are working on the completion of our new game–Supply Chain Impact— for the public training in Philadelphia in June and August and the content for the Supply Chain Insights Global Summit in September. Our goal is to help supply chain visionaries, around the world, break the mold and drive higher levels of improvement. Lora Cecere is the Founder of Supply Chain Insights. She is trying to redefine the industry analyst model to make it friendlier and more useful for supply chain leaders. Lora has written the books Supply Chain Metrics That Matter and Bricks Matter, and is currently working on her third book, Leadership Matters. She also actively blogs on her Supply Chain Insights website, at the Supply Chain Shaman blog, and for Forbes. When not writing or running her company, Lora is training for a triathlon, taking classes for her DBA degree in research, knitting and quilting for her new granddaughter, and doing tendu (s) and Dégagé (s) to dome her feet for pointe work at the ballet barre. Lora thinks that we are never too old to learn or to push for excellence. I think there are plenty of people who can serve as supply chain architects. The problem as I see it is more from the executive level. Actually Lora’s question generalizes. If we encapsulate the article’s primary theme, it is that supply chains should and can be much more rational than they are. However, companies are generally much more chaotic than anyone would like to admit — it’s a bit like our interpretation of most institutions — there is a strong bias to present a model of rationality than there is to criticize these institutions for being irrational or lacking in executive competence. Periodicals like Forbes or Fortune, etc. have enormous revenues because they cover their advertisers in a way that is positive. Therefore accuracy is secondary to revenue generation in the business media. We frequently talk about the skills gap at the bottom of society — which is always rectified simply by more education, but what is essentially never discussed is the skills gap at the top, in the executive suite. And in my experience this skill gap is enormous. It is undeniable that supply chains could be far better designed, but the limitation is less in the availability of supply chain architects, and more with executives, who are most frequently either distracted, lacking in domain expertise, or pushed to focus on short-term objectives to focus on long-term sustainable improvement that this article suggests.